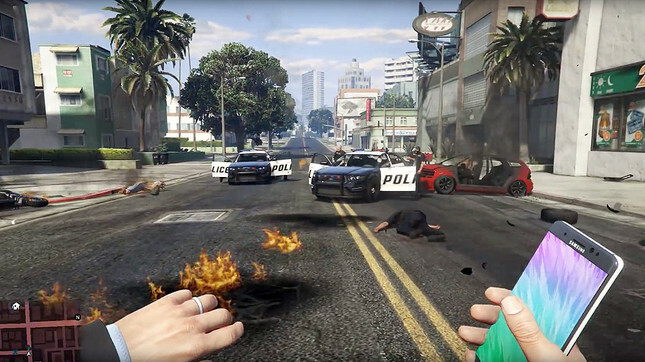 Samsung this week tried, and failed, to take down a YouTube video depicting a Grand Theft Auto V mod that makes fun of its notoriously problematic Galaxy Note 7 smartphone. The mod replaces the game's sticky bomb weapon with a model resembling the Note 7; the video in question depicts user "sdaddy345" blowing up a range of vehicles with the modded weapon. Earlier in the week, the video was taken down via a copyright demand attributed to Samsung, generating widespread derision towards the company. Sdaddy345 filed a counter-claim, however, which appears to have worked, since the video is now back online on their YouTube channel Modded Games. They also posted their correspondence with YouTube on the matter. The Galaxy Note 7 has been in the news for all the wrong reasons lately, with Samsung recalling units, halting sales, encouraging returns, and ultimately discontinuing the product, due to numerous reports of faulty, exploding batteries. Issues are so widespread that American air authorities and several international counterparts now prohibit taking the phone onto any aircraft, and even President Obama has joined the throngs of commentators cracking wise about the product. The mod is still available for the PC version of Grand Theft Auto 5 - ironically, the only way to get one's hands on the phone now that it's been cancelled.